The following was found in A History of the town of New London, Merrimack County, New Hampshire, 1779-1899 on pages 452-454. CLOUGH, BRIG.-GEN. JOSEPH M.—Numbered among the distinguished citizens of the town is one whose civil and mili­tary record stamps him emphatically as a leader, Brig-Gen. Joseph M. Clough. The only son of Hugh B. and Hannah (Messer) Clough , he was but a lad when his father settled in N. L. (New London, NH) After a few years he returned to Enfield, where he res. until 1848 (with the exception of six months at Norwich university, Vermont, under General Ransom), and for three winters was master of the district school. From Enfield he went to Manchester as a machinist, and later was at Suncook and Lowell, where he had charge of the spinning-room of the Hamilton corporation for three years. In 1854 he returned to Manchester, and held a similar position in the Amoskeag mills. His fondness for a military life dates back to his youth. At Enfield he was adjutant and captain in the militia ; then rose from the ranks to be commander of the City Guards at Manchester, and at Lowell was in the company of City Guards commanded by Benjamin F. Butler. In the ” hard times” of 1857 he took up his residence in N. L. temporarily, but remained to get out the lumber for the addition to the meeting house,, and lived in what was then the “Retreat,” nearly opposite the church. April 26, 1861, he enlisted as a private in the First N. H. V., in company with Andrew J. Sargent, and four days later was appointed first lieutenant of Company H ; re-enlisted in the Fourth regiment, Sept. 10, 1861, and was appointed captain of Company H ; was wounded in the mine explosion at Petersburg, Va., July 30, 1864, and discharged Sept. 17, 1864. Less than a month later he accepted a commission as lieutenant-colonel of the Eighteenth regiment, and was first in command until the regu­lar commission of Colonel Livermore in January, 1865. In the night attack on Fort Stedman, March 29, 1865, Colonel Clough was again wounded, but continued in the service until he was mustered out July 29. 1865. Following the attack on Fort Stedman he was brevetted as brigadier-general on recom­mendation of Gen. 0. B. Willcox, then commanding the First division of the Ninth Army corps. and received his commission at Washington. He was also recommended by General Will­cox and Senator Daniel Clark for appointment as first lieuten­ant in the regular army, and passed the military examination for the Twelfth U.S.I., but declined an acceptance on account of his health, which was greatly broken. Such is the brief outline of the service of this gallant soldier in the –War of the Rebellion. He was engaged in the following battles: Pocotaligo, Morris Island, Sieges of Wagner, Sum­ter, and Petersburg. Bermuda Hundred, Drewry’s Bluff, Weir Bottom Church, Cold Harbor, Hatcher’s Run, Deep Run, Petersburg Mine, Fort Stedman, and the capture of Petersburg in March, 1865. 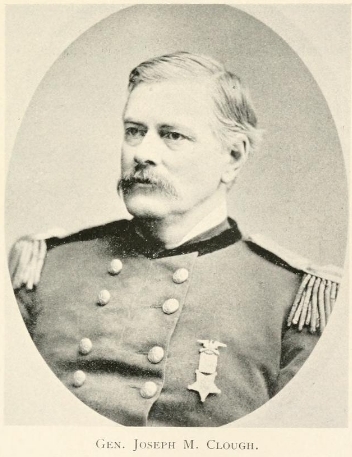 At the close of the war General Clough returned to N. L., and for thirteen years was in the U. S. Mail service, running from Boston to Lancaster and St. Albans, Vt. For seven years prior to 1884 he was commander of the First brigade of the N. H. N. G. As a civilian, General Clough represented the town in the legislature of 1866, and to fill the unexpired term of Edwin P. Burpee in 1897 ; in 1881—’82 he was state senator from this district. In his pleasant home on Main street General Clough has a store of treasured heirlooms and memorials of his military life. Not the least valued of these is his worn and tattered headquarters’ flag. the second one floated in Petersburg after its capture. General Clough’s first wife, Abiah (Bucklin) Clough, was b. Oct. 22, 1828, and d. Dec. 17, 1873. He m. (2), in 1874, Cornelia (Smith) Chase, dau. of William P. and Rhoda (Spooner) Smith. Mrs. Chase’s dau. Minnie, b. Nov. 10, 1868, was as tenderly cherished by her stepfather as his own children. She was educated at Colby academy, and taught in the district schools until her marriage to George K. Burleigh, a jeweller of Tilton. They have one child, Elizabeth Cornelia, b. May 27, 189o. Ella A., b. June 25, 1852 ; d. of typhoid fever, July 16, 1S53. Charles B., b. Aug. 13, 1857 ; m. Minnie E. Edgecombe, a native of Leominster, Mass., and res. in Medford, Mass. ; d. Oct. Io, 1896. Charlie Clough was a great favorite in the home of his boyhood, and his successful career was watched with interest by those who remembered his early promise. He was educated at Colby academy, taught in the State Re­form school at Manchester, was clerk in the Boston naval office under Col. Daniel Hall during President Hayes’s ad­ministration, and since then had been a valued and trusted employee in the firm of C. F. Hovey & Co., of Boston, having charge of their linen department. He was a member of Starr King lodge, F. & A. M., of Salem, Mass., and of the Sons of Veterans. William P., b. Sept. 13, 1879; is a student at Colby academy.